Watch out for those dodgy injuries while gaming, says Daniel Etherington of BBCi Collective in his weekly games column. Can you imagine the injuries incurred when the drivers of those super-fast futuristic vehicles in racing games, like the exhilarating F-Zero GX or the comparatively average Xgra Extreme G Racing Association, wipe out? But never mind the injuries suffered by your in-game characters, what about you? A sofa, a console, and a joypad do not really sound too dangerous. But from the frenetic manhandling of your controller in a fighting game, to the similarly intense activity of playing a super-fast racer, there is a definite physical element to some gaming. Those finger tendons and neck muscles can suffer when your game of choice involves efforts to overtake a craft travelling at 1,400kph. The worst strain to my body I experienced while gaming was the result of multiple attempts to defeat Ridley in Metroid Prime - my forefingers were knackered for days. 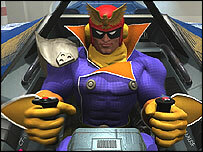 Working that accelerator in F-Zero GX is having a worryingly similar effect. On a more serious note, there have been many suggestions in the medical community about video game-related physical ailments. The extreme version of the effect on tendons is similar to tennis elbow. 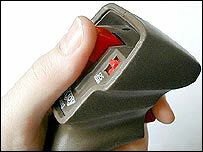 It is called tendonitis, or in more sensationalist terms, Nintendoitis and is a form of RSI (Repetitive Strain Injury). Another alleged problem for gamers is over-development of muscles in the arm, shoulder and neck on one side of the body. There have even been reported cases of abrasions resulting from trying to manipulate badly-configured buttons. Possibly the most bizarre games-related condition that has been reported is Hand-Arm Vibration Syndrome (Havs), something previously recognised in operators of jackhammers, but now increasingly associated with joypad vibration. Then there is the old classic eye-strain, and even the question of motion sickness, disorientation and seizures. This list goes on. I am sure such things are an occupational hazard among F-Zero pilots, but in the real world they are rare. One that no one seems to have started reporting yet is the potential to bruise yourself or break things from tripping over cables. Thankfully, wireless controllers offer a clear way forward with this particular issue. In terms of avoiding the recognised dangers of gaming, the leaflets packaged with games have some salient reminders. We all know that it is often easier said than done, but the bottom line is in all cases, the old chestnut of everything in moderation because habits can become obsessions. If you must play F-Zero GX for hours on end, as many will because it is a quality game from a classic 13-year-old franchise, beware the bodily damage that might result from an exasperated girlfriend/partner/housemate assaulting you.